What Exactly Are Managed Services for Sales Chat? A managed service could be the right choice if your company is overwhelmed with new business, looking to cut costs or struggling to hit sales targets. Irrespective of the size, structure or financial standing of your company, a managed service can work for you, taking into account the unique circumstances and requirements of your company. Typical departments that outsource to a managed provider include IT, customer support, sales, accounting and HR. With the emergence of live chat as a popular customer service channel, and recently, as a reliable option for B2B sales, many companies are now choosing to have their sales chat function managed the same way. This could be a viable option, especially if you don’t want to spend time and resource on getting it set up, managed and ensuring it gives your results. But, what exactly does a managed service for sales chat consist of? Here we explain in further detail. Sales Chat Agents are the core of what you get with managed services, and you can choose to have one or more depending on the amount of traffic to your site. 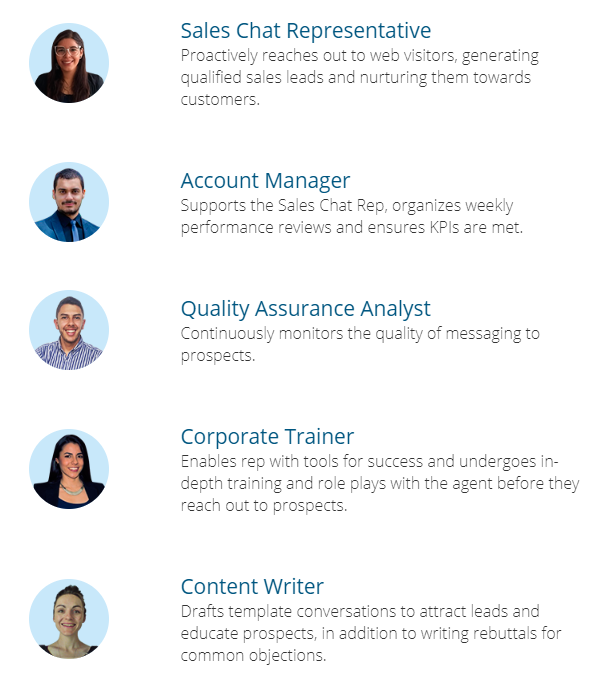 Along with these Sales Chat Representative(s), you also get a talented team that supports them consisting of an Account Manager, Content Writer, Quality Assurance Analyst and Corporate Trainer. Chat Agents are specially recruited and trained to work according to a tried and tested chat procedure established by the MSP, and have the experience of handling different queries and situations whatever they may be. They are instructed to follow a chat script to respond to user’s questions and are able to direct them to different departments (for a sales demo or tech support) if required. You don’t need to worry about losing control with your outsourced team as your Account Manager (AM) will communicate about your team’s performance on a weekly, or even daily basis when required. If you’re wondering about how involved (or not) you should be with a managed service provider handling your sales chat, then be assured that the AM will set up regular sessions where you can discuss quality, performance, feedback and follow-up. There will be discussions on setting goals, KPIs and professional development for your Sales Chat Agents, keeping you updated every step of the way. Additionally, the AM can refer back to the chat conversations and interpret visitor data and chat analytics, which is very useful to uncover essential insights about your buyer persona including their browsing habits, customer behaviour and pain points. This information can be passed on to Sales Agents who can use it in their interactions to create trust and build relationships. Each team has its own Quality Assurance analyst, who apart from keeping track of agent performance, also continuously evaluate and calibrate the quality of chats to improve standards with a view to increasing sales. A QA process can not only be used to coach agents and improve their on-the-job performance, but also helps to ensure sales chat efforts are aligning with the company’s aims and objectives. Constructive feedback and ongoing professional development is provided to make them sales superstars - helping them fine-tune and perfect their skills in different aspects of sales - listening, asking probing questions, pitching, presenting, objection-handling and closing. Managed service providers take advantage of content writers to draft automated chat messages (also called ‘playbooks’), which pop out to users depending on the web page they are browsing. Content that writers will include in playbooks may involve qualifying questions by bots to check if a web visitor is a qualified lead, and probing questions that help the chat agents understand a pain point or challenge a prospect is facing. They also create chat templates and transcripts which agents can follow while dealing with specific queries or when faced with different situations, in addition to responses for handling common objections. Sales Chat Teams stay up-to-speed with the latest sales trends and technology, which they can actively incorporate into their jobs. Every Sales Chat Agent has a dedicated trainer who coaches them over a 2-week period, in which they undergo roleplay sessions and in-depth understanding on chat etiquette and other processes, preparing them before they start answering chats and actively engaging with customers. They are trained in the latest cloud-based software and tools designed to attract and nurture leads, such as a CRM to view and edit customer data. They are multi-taskers who will be able to liaise with your sales team and pass on important information about your buyer persona, and also coordinate with them to follow up on sales or a demo call when required. Using a managed service will take care of the HR needs of your sales chat team, starting from the recruitment process, performance management and other essentials such as benefits, salary and expenses. All members of your new team undergo a strict vetting and recruitment process, and are handpicked for your company so that they have experience and training in your industry, and efforts are taken to make sure they are the right fit for your company’s values, culture and ethos. They are specially selected as their skills and abilities are in line with those required of a sales chat agent - empathy, listening skills, the ability to multitask, think on their feet, and provide quick solutions. There’s plenty of tedious research and admin which you’d need to do to kickstart the process of getting an in-house sales chat team up and running. From picking the best sales chat software, to setting up various chat processes and procedures, and making use of the latest trends and technologies in the live chat space - your managed service provider will cover all these bases for you, at a fraction of the cost. What’s more, you can scale up and down as needed according to the volume of web traffic you’re receiving. With every aspect, from HR, recruitment and training, to professional development, account management and quality assurance, all taken care of, choosing a managed service for your sales chat could be that crucial decision that takes your business to the next level.